Jesse Sharrard of the Greater Pittsburgh Community Food Bank was voted "Best Of" SNEB Talks with his presentation — Thanks to Barbara Storper of FoodPlay Productions for underwriting the $250 prize. He has shared the recipe cards he discussed in his talk and writes that the SNEB conference motivated him to create a carnival game called "Tater Toss" and launch the first issue of "Spuds Illustrated." 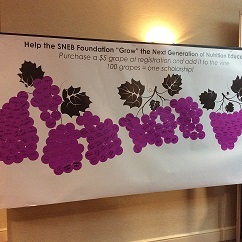 The SNEB Foundation sold $5 grapes during conference will the goal of funding additional conference scholarships. We sold 261 grapes for a total raised of $1,305. Well done! The post-conference tour featured a visit to the Greater Pittsburgh Community Food Bank where attendees presented a check for $400 collected from tour registration fees. Program proposals for the 2016 conference are due Oct. 9 and the new online submission form is ready. New this year is the ability to save a draft of your proposal before its submitted. This will require you to set up a username and password to get started. Click here for details. Can you provide suggestions for a low cost, child friendly cookbook ($5-$10) to use as a program incentive for limited resource families? Check out the listserv archive and search by thread to see the responses. Are you an SNEB member and would like to join the listserv? Email rdaeger@sneb.org. This webinar will focus on the benefits of following a higher protein diet for weight management. An overview of the current body of science on protein and weight management will be reviewed, and practical tips and ideas to help bring the research to life will be shared. Special attention will be placed on differences in protein quality, recommendations for protein quantity and the importance of timing protein intake properly to maximize the benefits for weight management. Webinar sponsored by the National Dairy Council. Translate the latest science examining the role of protein on weight management and its related benefits (satiety, fat loss and/or muscle preservation). Educate peers and the public on the importance of protein timing and distribution as well as high quality, higher protein diets for maintaining a healthy weight and an active lifestyle over time. Identify and apply practical solutions to help patients/clients determine appropriate protein quantity and methods for optimizing timing of protein intake, and advise them on how the integration of protein can help support the benefits of regular physical activity. Build patient tips and menu plans focused on improving satiety between meals and throughout the day, recommending quantities and optimal timing for protein consumption. These one-hour webinars, conducted at noon EDT on Mondays, will provide valuable learning opportunities for anyone wishing to expand their knowledge of creating and validating surveys. Participants also earn CPE by attending. If you would like to be registered for the entire fall webinar series, email rdaeger@sneb.org or register for individual sessions here. Queen Mary University of London via EuerkAlert! Penn State University via EuerkAlert! University of the Basque Country via EurekAlert!